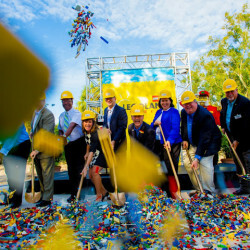 LEGOLAND® Florida General Manager Adrian Jones officially announced the park’s much anticipated LEGOLAND Hotel will open in 2015. 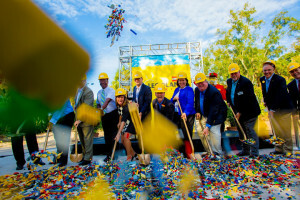 The announcement was made alongside community leaders with a ceremonial groundbreaking moment at the site where the hotel will be built, directly to the left of LEGOLAND Florida’s entrance, just steps from Lake Eloise. 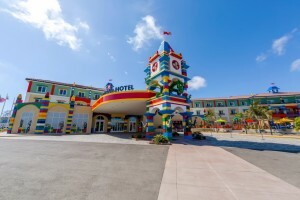 Welcoming guests with a multicolored exterior and entrance, the four-story LEGOLAND Hotel will immerse families with young children in the world of LEGO®, as an extension of the vibrant and interactive theme park experience. 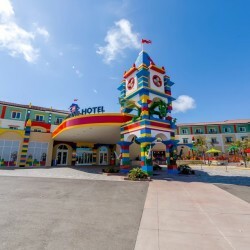 Created to bring children’s imaginations to life, the LEGO-themed hotel will feature 152 brightly colored and highly themed rooms and suites, LEGO décor; interactive play areas; a pool and a restaurant. 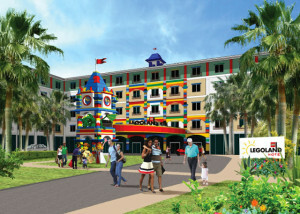 LEGOLAND Florida Hotel will add 250 construction-related jobs during the construction, and another 250 jobs to its employee base to staff the new hotel upon completion. This will be the fifth LEGOLAND Hotel in the world joining LEGOLAND California, LEGOLAND Windsor and LEGOLAND Billund hotels. 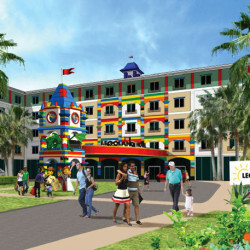 LEGOLAND Malaysia Hotel will soon open its doors. At LEGOLAND Florida, families enjoy more than 50 rides, shows, attractions, a water park and the all-new LEGO World of Chima presented by Cartoon Network. 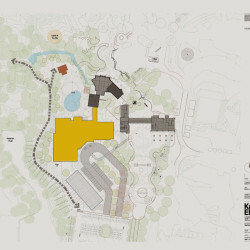 At the World of Chima, the whole family can board an interactive splash battle ride, The Quest for CHI, and kid’s can splash and play in Cragger’s Swamp and race handheld rip-chord powered vehicles at the SpeedorzTM Arena. This entry was posted in Home Page, Home Page Slider, News and tagged Adrian Jones, Cragger’s Swamp, Florida, Lake Eloise, LEGO World of Chima, LEGOLAND, LEGOLAND Hotel, Polk County, Resort, Speedorz Arena, The Quest for CHI, Theme Park Adventure, TPA. Bookmark the permalink.